Week 4 of Double Up Wednesday – 4 Weeks Down!!! Super Bounty J1 Secret Missions 2: Page 4…. ZAP!!!!! 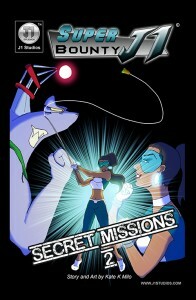 Previously in Super Bounty J1: Secret Missions…. J1 and team are going after Jammerhead, a genetically modified shark that has escaped from the DNA seaside laboratory. J1 and the Panditos have lured Jammerhead into a trap, and J1 is going to report their success to Master Chin. Super Bounty J1 is pretty skilled, but did she REALLY catch the bounty so easily?